It was 55 years ago today (April 16th, 1964) that the Rolling Stones released their self-titled debut album. The collection, which was based around the Stones’ stage act at the time, featured covers of Bobby Troup‘s “Route 66,” Willie Dixon‘s “I Just Want To Make Love To You,” Jimmy Reed‘s “Honest I Do,” Bo Diddley‘s “Mona (I Need You Baby),” Chuck Berry‘s “Carol,” and Marvin Gaye‘s “Can I Get A Witness,” among others. 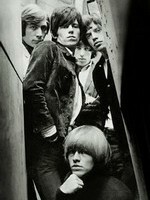 The album featured the first Stones-released Mick Jagger–Keith Richards original “Tell Me (You’re Coming Back),” along with the group’s co-write with Phil Spector — “Little By Little” — which like all of the Stones’ early group collaborations was credited to the pseudonym Nanker Phelge. The striking cover shot of the band by David Bailey was groundbreaking at the time in that it didn’t feature the group’s name or the album title on the cover. The only identification was the iconic Decca label in the upper right hand corner. The Rolling Stones went on to top the UK album charts for 12 weeks. Its American counterpart — with a slightly different track listing — retitled England’s Newest Hitmakers went on to peak at Number 11 in the States.